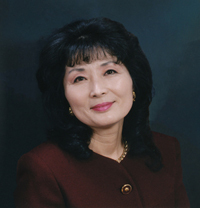 Dr. Yoshiko Higurashi is Professor of Japanese and the Director of the Japanese Language Program in the Department of Linguistics and Asian/Middle Eastern Languages at San Diego State University (SDSU). She is also the Director of the Japanese International Programs at SDSU. Dr. Higurashi received her B.A. in English from Waseda University (Tokyo), her M.A. in Linguistics from the University of Oregon, and her Ph.D. in Linguistics from the University of Texas at Austin. She came to SDSU after three years as an Assistant Professor at the University of the Pacific. She was promoted to Professor in 1990. Dr. Higurashi joined the faculty of SDSU in the Fall of 1983 as the 14th professor to take charge of the Japanese Language Program in its first 17 years. She was able to create both major and minor degrees in Japanese with the strong support from the University Administration, the Japanese government, the U.S. government, and the local San Diego community. She also created the Japanese Language Scholarships and has been able to raise funds annually and host an award presentation reception for outstanding students of Japanese at the end of each academic year since 1983. She is in charge of both the SDSU Japan Direct Exchange Programs and also the internship programs for Japanese majors, which she established in order to help SDSU internationalize its curriculum and develop closer ties with the San Diego community. Her teacher/scholar career as a linguist has blossomed at SDSU. 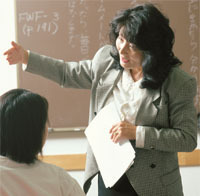 With the publication of Volume 3 of Elementary Functional Japanese in March 2000, Dr. Higurashi completed her project to publish textbooks for college students at all three levels (elementary, intermediate, advanced). The Northeast Asia Council of the Association for Asian Studies has selected her as one of its 12 senior scholars for the Distinguished Speakers Bureau. Her successful three-year term, which began in 2011, was extended a fourth year into 2015. She has been directing the National Faculty Development Institute “Incorporating Japanese Studies into the Undergraduate Curriculum” known as the Japan Studies Institute sponsored by the American Association of State Colleges and Universities (AASCU) since 2006. Each summer from 2014 to 2017, Dr. Higurashi conducted JSI-Japan Program. She brought AASCU-JSI's past participants to Japan in order to better incorporate information about Japan into their courses. In January 2015, Dr. Higurashi was awarded the Reischauer International Education Award by the Japan Society of San Diego and Tijuana. She is currently involved in Rikkyo University's research project on Dyslexia in Japanese Classes in the World, a study sponsored by the Japanese government. She represents the U.S. and will help Rikkyo develop a curriculum and textbooks specifically tailored to international students with dyslexia. She is also working on her 6th book and feels fortunate to be a part of the SDSU family. Professor Higurashi's research is in linguistics, speech pathology, second language pedagogy, and intercultural communication. Higurashi, Yoshiko. (1996) Kaigai de Oshieru Nihongo (Teaching Japanese Abroad), Tokyo: ALC Press, pp.171. Higurashi, Yoshiko. (1998) Elementary Functional Japanese: Intercultural Communication, Volume 1, Tokyo: ALC Press, pp.xxi, 423. Higurashi, Yoshiko. (1999) Elementary Functional Japanese: Intercultural Communication, Volume 2, Tokyo: ALC Press, pp. 432. Higurashi, Yoshiko. (2000) Elementary Functional Japanese: Intercultural Communication, Volume 3, Tokyo: ALC Press, pp. 410.